Blackberry's Q10 (and the forthcoming Blackberry Classic and Blackberry Passport) are unique in being (as far as we are aware of) the only recent smartphones that offer a physical keyboard. This is a quick review of the current accessibility features of Blackberry's operating system BB 10.2 as used on the Q10 smartphone. INCOBS recently offered a smartphone helpdesk at a local event at BSVH, the local organisation of blind and visually impaired people in Hamburg. Many people came and wanted to get a hands-on experience of the few smartphones we had brought (an iPhone 5c, the Google Nexus 4, and a Windows Phone the Nokia Lumia 1320). We then noted that quite a few helpdesk visitors who had been using phones with physical keys in the past asked whether physical keyboards still existed in the smartphone world. The answer is that very few such devices remain. The Android phones with physical keyboards are now quite dated and only available second-hand. They are stuck with a dated version of Android (mostly 2.3 Gingerbread) with a hardly usable TalkBack version. Nokia's operating system Symbian which used to power feature phones with keyboards and Nuance's TALKS & ZOOM software installed, has been discontinued, and Nokia's new Lumia Windows Phones all come without keyboard. This puts Blackberry in the position of being the last device maker offering physical keyboards on new devices. 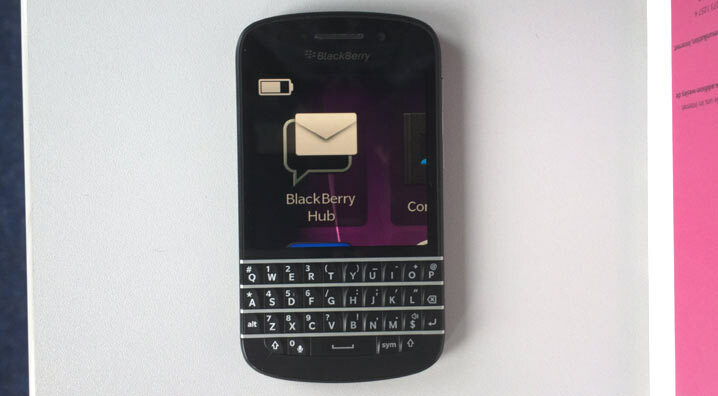 The Blackberry Q10 is a well-built device that is comfortable to hold. It is turned on and off by pressing a button at the top edge. The interface and gestures differ from other Smartphone operating systems, with many things being activated via swipes from one of the edges. The Blackberry hub contains everything that comes in and goes out (calls, messages, and mails, including drafts). I found the Q10 very useful in my 2 week trial of the device (but I am a sighted user). I like the way apps can be minimised to thumbnails showing their current state by swiping up - its very quick to swap between them. I found writing text on the physical keyboard easier than using a virtual keyboard. Word suggestions while typing can be enabled in the system settings and are off by default. Email, messages etc. worked flawlessly. One issue I noticed was that the battery didn't seem to last very long. The text elements and icons in the Blackberry interface are generally very contrasty and use a simple and pleasing style. Both text magnification on the system level as well as a zoom function (here called Magnify mode) are available. Let's cover both in turn. The Accessibility > Display settings allows users to increase the default text size of 8pt up to 18 pt. The way this size is carried through on settings displays and other Blackberry apps varies. Text on the main settings screen, for example, doesn't get larger than 10 point. On most other settings screens the text appears with the chosen size. Fig. 1 Blackberry Hub. The most important app on a Blackberry is the Hub - here seen in the default size and with system text size set to the maximum of 18 point. Size settings are also carried through to the all-important Blackberry Hub. At the maximum text size (18pt), the text here is large, but the heavy truncation of senders and content titles can make its content difficult to use. The text of the Blackberry Hub context menus is also increased (from 8pt to 11pt), but just so far that they still fit in their allocated space (with a section of the hub still visible below) – compare Fig, 2. Fig. 2 Enlarged Blackberry Hub menus. Text size does not get larger than 13 pt here. Size settings also affect Emails and Messages which are shown at a much large size (13pt) if not the set size (see screenshots), with a good size also for sender, account, and mail title. Fig. 3: Blackberry apps with magnified text. Large system text size settings (18 pt) affect system settings but also other standard apps - here Calendar (new entry) and SMS messages. Like on the iPhone, text size settings have no effect on Blackberry's home screen with its tiny 5 pt app labels, or on the dashboard menu that can be brought in by swiping from the top (just 6pt bold). The browser contains a reader view which allows increasing the text size with a reflow of text to the point that just a couple of words fit on a line (at about 24 pt). Fig. 4 Blackberry Browser and its reader mode. In the Browser, users can magnify pinch zoom as expected. The reader mode also offers a text resizing with a proper reflow. A contrast mode (color inversion) is also available here. The accessibility settings in BB OS 10.2 include a Magnify mode that allows users to zoom in and out via a pinch gesture. Text can be magnified up to about 4.5 times the default size (but edges get blurred). A two-finger swipe from the top toggle between default size and magnified view, a two-finger drag gesture moves the magnified section. On the system level, the only setting is to change the white balance which turns the background white into a blue or yellow tint. The reader mode of the Blackberry browser also offers an inversion of colors to read text white on black. The browser remembers users' last text size setting when switching to reader mode. Enabling the Screen Reader is as simple as on the iPhone: it works via a triple-press on the power button. The Screen Reader is currently marked as BETA so it is no surprise that it still has issues (covered below). The voice is quite tinny, a bit like the Android TalkBack voice. Volume, speed, pitch and language can be changed. While contents of important default apps are spoken, it should be noted that there are other apps that (currently) do not work with Screen Reader. The latest version of Docs To Go has apparently been updated to include screen reader support but this time round, we haven’t checked how well that works. Text input provides a keyboard echo on the Hub and its mail and text messages as well as in Contacts when typing a name to search, but not in Calendar. Blackberry's screen reader gestures differ from what is familiar to iOS and Android users. The main difference is that the touch-explore mode that continuously speaks elements as the user moves a finger over the screen is only invoked after an initial tab and a short hold before starting exploration. Activating the element that currently has focus works both by a second-finger tap while holding or via a double tap anywhere. Swiping to traverse elements does not seem to work reliably yet (more about that further down). Some elements are not easily reached by swiping, and swiping gestures seem to be ignored while text is read. Some elements that are visible and useful in normal operating mode (such as the close buttons on minimised items) are currently not exposed via the screen reader and cannot be activated. With Screen Reader on, the usual Blackberry default gestures from the edge should still work (as advertised), but at times we experienced difficulty when trying to get to screens like adjacent views of the home screen (for example, to get to the settings), or to get out of screens. At other times, there was no problem. Other dedicated Screen Reader gestures - such as swipe down, then left to stop reading to mute Screen Reader - can equally trigger default gestures instead (such as displaying the dashboard). We couldn't get to work some more complex gestures such as "Swipe up with two fingers and hold to go to the top". With Screen Reader enabled, horizontal swiping allows traversal of the elements (e.g. the apps on the home screen, or the screen showing minimized apps), Currently, swiping is not very responsive - sometimes nothing happens, at other times, a touch is registered and the focus set there. The focus when swiping through elements is easily lost and swiping then stops to work. Tap-and-short-hold can be used to bring it back the focus to an element. When swiping close to the edge, it is easy to accidentally trigger a default gesture instead (e.g., moving to an adjacent view of the home screen). We first had trouble using Screen Reader on the all-important Blackberry hub - it just repeatedly announced home screen - application. At another attempt, we could access listed items via swiping and touch-explore, but gestures (such as double-finger swipe to scroll) at times work with delay or have no effect. Blackberry told us that navigation on the screen is recognized as a key area for improvement and that this functionality is set to improve in the next release of the operating system, BB OS 10.3. Using the browser with Screen Reader enabled is currenly hardly possible - while vertical swiping offers a range of different navigation modes, horizontal swiping works in an unreliable manner. Links traversed in mode link navigation are read, but often cannot be activated or bring up another page visited earlier. Headings are often not read - instead, Screen Reader repeats heading - off-screen. Combined use of Screen Reader and Magnify mode? Using Screen Reader and Magnify mode together currently does not work. When Screen Reader is enabled, the magnification gestures (pinch, drag with two fingers) do not work. The Blackberry Q10 should be considered by users who need a moderate amount of magnification and like the comfort of a physical keyboard. Contrasts are generally very good and the system text size settings are honored in the Blackberry Hub and in what are probably the most important default apps: Mail, Messages, Contacts and Calendar. The browser has a reader mode which offers good text resizing. For blind users, the Screen Reader BETA is still too immature to make using the Q10 a real option. We expect that the announced system update 10.3 will bring significant improvements and intend to re-test the Blackberry Screen Reader soon. When you mentioned the lack of suggestions on the Q10 am I to presume you mean predicted text? If so then you need to go into the settings and enable it. Thank you for your input on this phone it's helped me. Thanks for the hint, that has escaped my attention. Will update test accordingly.